Olivet Institute of Technology (OIT) strives to equip believers with a sound biblical higher education, as well as cutting-edge knowledge and professional skills in the field of information technology. Students who graduate from the Information Technology Program are prepared to work in ministry environments that will enhance the ability of the Christian community to harness the power of information technology. The undergraduate program is a full-time, four-year program that incorporates a broad base of coursework in the liberal arts and biblical studies including a specific set of foundational courses in mathematics to ensure success in the IT major. Students applying to the undergraduate program must apply through the main Olivet University Admissions Office. Successful graduates are recognized with a Bachelor of Arts degree in Information Technology from Olivet University. Olivet Institute of Technology's faculty members are leaders in their respective fields, working in state-of-the-art facilities that are available for student use. Today's developers must be broadly educated and well-rounded to understand and interpret the news. In this regard, Olivet Institute of Technology undergraduates have advantages that are matched at few institutions. They are able to take courses from eminent faculty in five different undergraduate schools. Cultural and recreational opportunities are plentiful both on campus and in greater Bay Area. The high academic caliber of the student body makes for a stimulating environment in and out of the classroom. Olivet's undergraduate students come from many states, several foreign countries and a variety of backgrounds. More than half are female and almost a third are members of minority groups. Olivet University is an institution of biblical higher education dedicated to training ministry-bound men and women as biblical scholars and leaders, and to equipping them with the practical skills to preach the Gospel effectively into and after the ‘network generation’ – thus priming them to revolutionize the world through Christian mission. Within the mandate of the Great Commission the Olivet Institute of Technology strives for providing ministry-bound men and women with the best biblical education and training possible, for excellence in creating, applying, and imparting knowledge in computer science, information technology and data science through educational programs, research in collaboration with industry and Christian ministries, dissemination through scholarly publications, and service to the Church and the world. Olivet’s core learning outcomes are learning outcomes expected of every Olivet graduate regardless of program area. They describe core skills and abilities our graduates need to succeed in the professional world, and in a world that demands continuous learning--skills like critical thinking, problem solving, writing, speaking, and the ability to do information research and use technology. Olivet’s curriculums are intentionally developed to foster achievement of these outcomes in all of our students. Each program at Olivet, including Olivet’s graduate and doctoral programs, describe what graduates of their particular programs or program areas will be able to do as a result of learning experiences within their programs. They intentionally flow, and often overlap with core (university-wide) outcomes to some extent. When that is the case, program-specific outcomes typically require the student to demonstrate higher levels of competency in a particular outcome, or performance of the outcome in a context unique to that discipline. The following is a description of Olivet’s core learning outcomes expected of every Olivet graduate regardless of program area. se1: Develop habits of personal and corporate worship. se2: Learn the importance and power of personal and corporate prayer. se3: Examine the history of evangelism and the Church and its traditions. se4: Understand the power of a personal testimony. se5: Learn Scriptures that will help verbally articulate the Christian faith. se6: Communicate the Christian message in word and deed. bc1: A basic understanding of Biblical facts and principles. bc2: An ability to inductively and methodically study Scripture. bc3: An understanding of the culture(s) in which the scriptures were written and the importance of context to proper understanding. bc4: An overt understanding of the Christian worldview and its juxtaposition to other worldviews. bc5: The ability to relate Biblical principles to life situations. ae1: Acquire basic knowledge in a broad base of subjects. ae2: Conduct in depth study in areas of special interest or giftedness. ae3: Establish patterns of clear and logical thought that recognize the effect of unexamined prepositions. ae4: Learn to effectively communicate thoughts and ideas. ae5: Develop methods of study and research that lead to lifelong learning. es1: Learn to recognize and apply one’s unique academic, social, and spiritual gifts. es2: Gain an understanding and appreciation of the differences of others. es3: Learn to lovingly and effectively communicate with those of differing world views. es4: Recognize the importance of self-discipline and service. mi1: Apply Biblical principles to real life problems. mi2: Explore and develop areas of giftedness through Christian Service. mi3: Apply the knowledge gained to life ministry through targeted internships. The Olivet Entrepreneurship Learning Initiative is an initiative fostering entrepreneurial activities among Olivet students, faculty, entrepreneurs, and members across the Olivet community. The initiative encourages entrepreneurship and innovation across the University, bringing together many cross-curricular interests, including students from Olivet's diverse array of schools. Olivet University is among the growing number of accredited Christian institutions that offer areas of study across the spectrum of academic and professional fields. In addition to Biblical and theological studies, our programs include a growing number of fields including music, media, design, information technology, language, business, engineering, and architecture. These programs are accredited by the Association of Biblical Higher Education (ABHE). They provide quality and rigorous learning experiences that produce leaders with a solid knowledge of the Bible, and who are increasingly better equipped to face the modern-day challenges of their respective fields. Like an increasing number of ABHE-accredited schools, Olivet offers "programs of study not necessarily leading exclusively to church occupations but in all cases intended to foster Gospel pre-occupation regardless of one’s future vocation." Olivet University's mission statement says scholarship and practical learning go hand-in-hand. The University has always strived for "praxis" academic model - a two-part structure intended to link theory to practice. We want Olivet University to be a place where students are served with learning environments where they can apply their textbook knowledge effectively. In terms of curriculum, this translates into programs featuring traditional classroom learning as well as immersive field experiences. Foundational learning in classrooms and experiential learning in the real-world environments complement each other in important ways at Olivet. For instance, many of our graduate programs require students to commit 20 hours a week or more engaging in some form of real-world training or employment related to their fields while they complete their traditional courses. The objective of our praxis approach is to provide students with valuable professional experience that enhances their academic learning through curriculum-based, practical experience. As in all of our programs, Olivet's faculty are the key to success. Students enrolled in programs that require on-the-job experiences interact frequently (at least weekly) with Olivet faculty to incorporate these experiences in the learning process and draw connections between academic and professional areas of their programs of study. Olivet's Entrepreneurship Learning Initiative is our model focused on foundational and experiential learning that enables students to explore entrepreneurship under the guidance of qualified mentors. These mentors comprise a growing community of founders, experienced entrepreneurs, professionals working with start-up companies and small businesses with a calling to pass on their expertise to students across a broad range of topics and industry areas. By tapping into start-up expertise and extensive connections of Olivet's mentors, students gain access to knowledge, as well as opportunities to apply this knowledge in the experiential learning areas within their programs of study. The result? Better learning outcomes at Olivet and beyond, gained from the deeper perspective students build by testing the practicality of their academic learning in real-world experiences. Whether you're an experienced entrepreneur, a student interested in entrepreneurship, or both -- we invite you to be a part of a growing global community that supports the Entrepreneurial Learning Initiative at Olivet. There's never been a better time. How do I reach Olivet Institute of Technologies' admissions? How does a student take a class online? Students may apply online and receive a student ID and password. Once ID's are issued, students may access their appropriate courses from any computer by logging onto MY OLIVET. MyOlivet is online environment at Olivet where students, staff and faculty have easy access to all information needed 24/7. MyOlivet is currently run on Populi a third party, web-based college management software. It covers academics, admissions, billing, people, reporting, and a lot more. Integrated email and calendar complete the picture. The Library boasts an extensive collection of concordances, books, manuscripts, scholastic articles, video and/or audio documentaries. The library's catalog is available online, and students can easily access a description of any item in the collection. Library books can then be delivered electronically to borrowers; offline articles and excerpts can be scanned and delivered electronically. In addition to its catalog, the library offers access to 30,000 e-journals. Availability of journals and texts is subject to change. Olivet Institute of Technology’s program curricula emphasize practical learning and require students to get acquainted with a professional work environment already while enrolling in coursework. While students must secure internship offers themselves and an academic adviser will review and advise each student to ensure the position matches the program of study. Graduates take entry-level jobs in their focused fields. Many IT students work at ministry IT firms and companies. 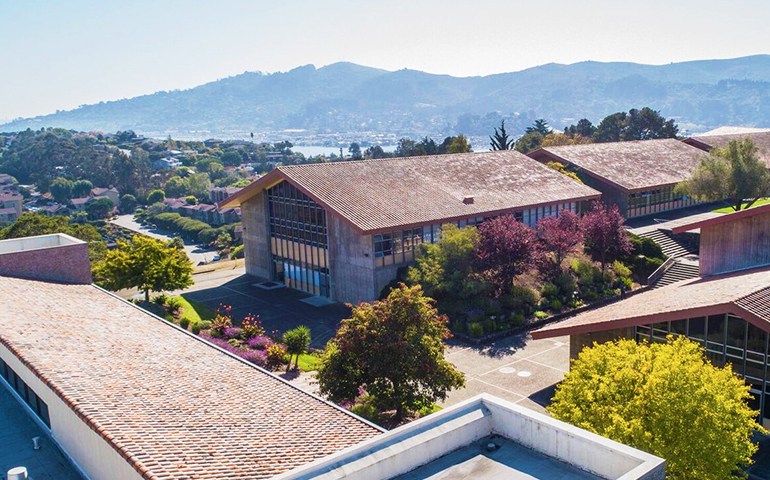 Olivet Institute of Technology is located at the San Francisco Bay Area Campus of Olivet University at 201 Seminary Drive in Mill Valley, California. The campus is located only minutes from the Golden Gate Bridge with breathtaking views of the Bay and San Francisco skyline. Student dormitories as well as apartment housing is available on campus upon application. The nearby interstate highway system makes this campus easily accessible to the Bay Area and California residents. The facilities include classrooms, lecture halls, and an auditorium. Facilities are accessible to persons with physical impairments. Tickets can be purchased online at https://marinairporter.com or for cash in the bus. Check for start and end times of service. Most likely midnight is the last ride. Ride share services are one of the most flexible means of airport transportation. Duration and prices vary by time of day, traffic, and service level booked.